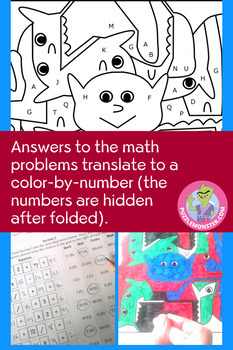 It's more than just a color by number activity, or a collection of math worksheets. It's more than just a Christmas art project or an escape room. 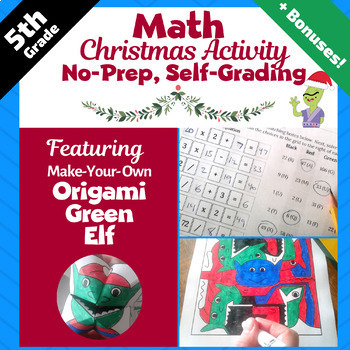 It's an exciting rare combination - a unique, gracefully differentiated, 5th grade Christmas math resource unlike anything your students have seen before! Plus, it is almost no prep from you, is differentiated for a diverse learning group, and is genuinely fun and creative at the same time. And it grades itself. And there's a prize at the end of the activity! 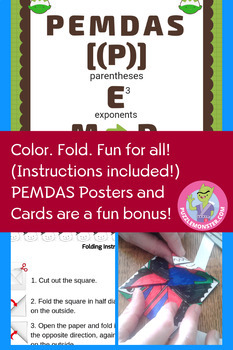 Plus there's also a bonus PEMDAS poster and cards. There's also a color-by-number page, and folding instructions to turn the coloring page into an origami Christmas elf - the lovely prize! 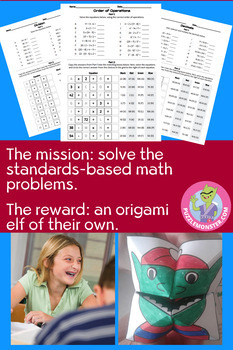 Based on their answers to the math problems, students use the key provided to color in the elf-themed color-by-number page. Cut it out, fold it up cootie catcher-style (instructions with diagrams provided), and there's a cool origami green elf as a prize. Regardless of which worksheet students receive, the correct answers will lead them to complete the coloring page the same way to create the origami Christmas elf. It's self-grading! If the students did not solve the equations correctly, the coloring of the elf will be clearly incorrect. And it's not obvious beforehand how to color the elf - it may LOOK obvious, but it is not! All of the answers are included, even a properly colored-in elf. All you have to provide is markers or colored pencils and scissors. No physical locks or Google forms required! Kids can solve the math worksheets independently or work in small groups for team-building. Every worksheet page is black and white so it's easy on your printer (there are a couple of color answer key pages if you want to project them and discuss as a class afterwards). Your students will get a prize they can take home with them. Teaches division, decimals and order of operations using Common Core standards.